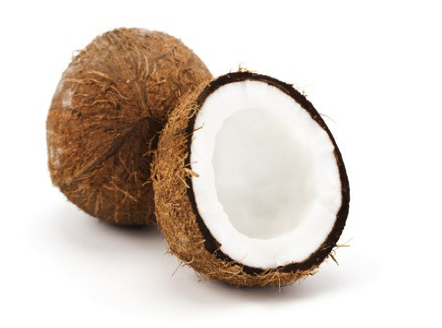 Bellaviewater's filters are infused with the finest granulated activated coconut carbon available, which aids in the greatest amount of reduction per contaminants in your drinking water, guaranteed by Bellaviewater. Bellaviewater's proprietary blend of adsorption medias naturally enhance the alkalinity of your drinking water, removes harmful contaminants, and protects naturally occurring trace minerals. Using Bellaviewater's unique Ionic Adsorption Micron Filter Technology water is passed through micro-porous filters to remove harmful pollutants and contaminants found in tap water. 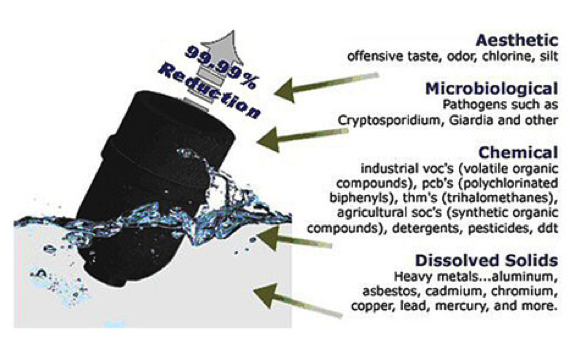 The filter removes up to 99.99% of contaminants including unpleasant taste and odors, Chlorine, DDT, MTBE, Benzene, THM's, Heavy Metals such as Arsenic, Lead, Mercury, Copper, Zinc, Aluminum, Chromium, radiological contaminants, and up to 90% of fluoride, leaving pure, high-quality pH water to better hydrate your body. The high-tech, porous, BPA-free plastic microfilter is infused with both the finest granulated activated coconut carbon available and Bellaviewater's exclusive adsorbing media that are coordinated carefully for the reduction of potentially harmful contaminants. Through medical technology, Bellaviewater created a uniform 0.2-micron (200 nano) absolute pore size for the assured reduction and removal of all four areas of contamination. Removal of contaminants with carbon is a surface phenomenon known as ADSORPTION, resulting from the molecular attraction of substances to the surface of the carbon. The controlled 0.2-micron (200nano) filter contains thousands of interconnected Omni-directional pores that result in a "tortuous path" for superior analytic reduction. This is done by forcing the source water through the filter. While the contaminants and pollutants are removed, our filters leave in the beneficial trace minerals such as calcium, magnesium and potassium. Bellaviewater's exclusive Ionic Adsorption Micron Filtration coordinates all processes of contaminant reduction by Adsorption, chemical bonding, chelation, and depth filtration. Each product is designed to guarantee the greatest amount of reduction per contaminant. By doing this, Bellaviewater filtering technology beats competing products in percentage of contaminants removed. 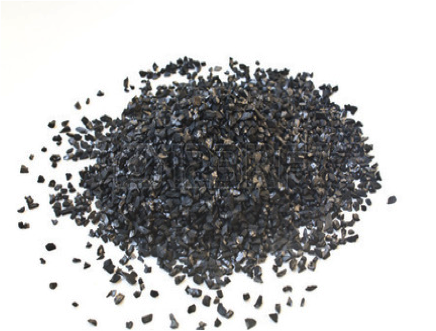 The micro-porous body of the filter spearheads the removal up to 99.99% of the contaminants and pollutants that can be found in drinking water. Aesthetic - Unpleasant taste and odors, cloudiness, silt, sediment, Chlorine and Chlorine by-products. Chemicals - Toxic chemicals (VOCs), Trihalomethanes, PCBs PCEs, detergents, and pesticides. Dissolved Solids - Including heavy metals such as Aluminum, Asbestos, Fluoride, Cadmium, Chromium 6, Copper, Lead, Arsenic and Mercury. pH - Naturally increases the alkalinity of source water up to 9.5 pH. 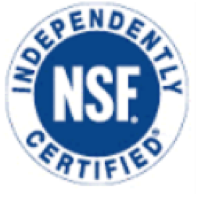 Bellaviewater's Ionic Adsorption Micron Filters are the most laboratories and field-tested of their kind in the world using EPA/ANSI protocols and tested to NSF Standards 42 and 53 by Broward Testing Laboratory. We're transparent with our customers.